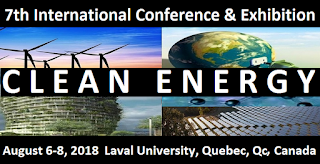 The 7th International Conference & Exhibition on Clean Energy (ICCE 2018) will take place Aug 6 - Aug 8, 2018, in Quebec City, Quebec, Canada. ICCE 2018 provides a platform for researchers, scientists and Industry experts to share their work while the participants from industry can promote their products. This is an excellent opportunity for the delegates from industry and institutes to interact with the their colleagues. The Keynote Lecture "Energy Economy in the Metallurgical Industry" will be given by Dr. Fathi Habashi. Dr. Fathi Habashi is the author of more than 50 books, 75 research papers, 120 book review, 4 patents and over 200 trip reports. Professor emeritus at Laval University in Quebec City, He holds a B.Sc. degree in Chemical Engineering from the University of Cairo, a Dr. techn. degree in Inorganic Chemical Technology from the University of Technology in Vienna, and honorary degrees from the Technical University of Oruro in Bolivia, the Saint Petersburg Mining Institute in Russia, and the National University of Engineering in Lima, Peru. He is a Fellow of the Canadian Institute of Mining, Metallurgy, and Petroleum, and was holder of the Canadian Government Scholarship in Ottawa (1960-62). He taught at Montana School of Mines, worked at the Extractive Metallurgical Research Department of Anaconda Company in Tucson, Arizona before joining Laval in 1970. He was guest professor at a number of foreign universities, a guest lecturer at a number of institutions, and consultant to the United Nations Development Program for the Cuban Laterite Project. He authored Principles of Extractive Metallurgy in 4 volumes and edited Handbook of Extractive Metallurgy in 4 volumes. The Keynote Lecture " Waste to Biogas, What is Next" will be given by Mr. Xu Fei (Philip) Wu. Mr. Xu Fei (Philip) Wu is founder and Chief Scientist of W&Y Environmental International Inc. (W&Y), a Canadian Environmental and Sustainable Energy Technology company with patented landfill processes and proprietary waste to energy technologies. He has worked in environmental and sustainable energy fields for over 25 years. Before W&Y, he worked for Conestoga-Rovers & Associates limited, Microbe Environmental Science and Technology Inc. of Canada and, the Ministry of Nuclear Industry and Space Flight Industry of China. The Keynote Lecture " The Challenges of Producing Biofuels in an Energy-Rich Country" will be given by Dr. Jean-Michel Lavoie. Dr. Jean-Michel Lavoie is founder of Biomass Technology Laboratory and professor at the Chemical and biotechnological engineering department, Université de Sherbrooke, Quebec, Canada. He holds 10 patents of which 4 are under license to the industry. He is the author of close to 70 peer reviewed paper in Journals. Dr. Lavoie was the Representative of Canada at the Art-Fuel forum (EU) (2017-2019) & Champion for the government of Canada (2015 & 2017). He received honor at the 25th Energia Awards.